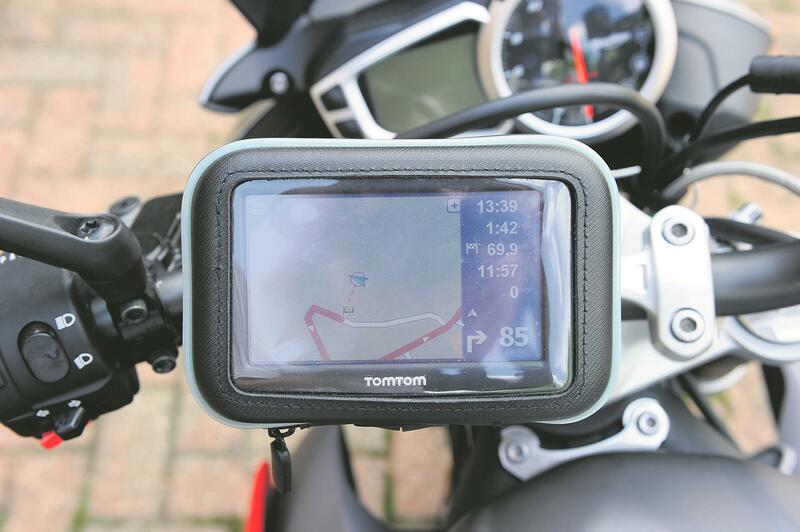 What’s good: This device can save you hundreds of pounds, letting you use a basic TomTom car sat-nav (£80) instead of a bike-specific sat-nav (£240-£450). I’ve run it for several thousand miles on a BMW R1150GS, Ducati 600 Monster and Ducati 900SS. Bikes with proper handlebars are easiest; the bar mount (included for your £18) clamps on and away you go. A sat-nav cable (£18) hooks up to your bike battery, or you can cobble up a 12V socket if your bike doesn’t already have one, and use a conventional cable. Sportsbikes need a ball-and-socket Ram arm (from £9), and a bit more thinking about. A hollow steering stem is a good place to bolt the Ram arm mount (£14) using a Rawlplug and screw. Or you can bolt it to a bar, bar clamp, top yoke or fairing bracket. I had to make up simple spacers for my SS and the GS to get them secure. It took 10 minutes and some aluminium tube, so you do need basic fitting skills. The touch-screen works through the flexible window, and you can usually find an angle to see the screen, even in bright sunlight. I think the whole system is wonderful. What’s not? The brass screw that locks the case in place on the stem is a bit fiddly and you can drop it. Don’t do this on a gravel drive. The case isn’t 100 per cent waterproof; damp air gets in through the cable hole and seams, and can later steam up the inside – but it’s never been a big problem. Product advice: Which sat nav to go for? Sat navs and smart phones which warn of speed camera locations have been banned in France.